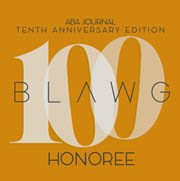 President Obama has published a 56-page piece in the Harvard Law Review (Vol. 130, at page 811), on the president's role in advancing criminal justice reform. At page 25, Obama first mentions the idea of "reinvigorating clemency" but the piece says nothing - as in zero - about actually reforming the clemency process. Apparently, the President, quite unlike the scholarly community, sees no need for reform there. The piece first notes clemency cannot be "a substitute for the lasting change that can be achieved by passage of legislation" - a position which, quite literally, no one anywhere in the entire world takes. The President then, quite awkwardly, writes, "the Framers gave the President this authority to remedy individual cases of injustice." Does the constitutional law professor not know that the pardon power includes the power to grant group pardons / amnesties? Alexander Hamilton (commonly considered a "Framer"), in the Federalist Papers explicitly offered up the example of the potential usefulness of clemency to quell rebellions, episodes very rarely ever caused / executed by an "individual." The President argues "at one point in our nation’s history, [the pardon power] was a power used frequently." Without taking the effort to provide any coherent definition of "frequently," it would have been much more accurate (and informative) to write: "for most of our nation's history, the pardon power was a power used frequently." Obama then proceeds to explain the decline in the use of the pardon power in terms of the system of federal parole, the "tough-on-crime rhetoric" of the 1980s and the "political push" in that period for “truth in sentencing.” It is a reasonable enough set of explanations, but very far from some of the very fine expositions of scholars over the last decade. The notion that the 1980s were a particularly important period re the decline in the use of clemency, however, is an ancient error, disproved by a world of data, over and over - somewhat ironic as the President, near the end of the article, calls for better data collection, and data-driven decision making. Indeed, the hallmark of this entire section is how little it is informed by empirical data. More notably, President Obama says nothing, not a word, about how how any of this stuff is linked to presidential behavior and decision making. The pardon power is unilateral, independent, free from restraint. Thus, a central factor has to be the responsibility lodged in the human being called "Mr. President." It is not all about uncontrollable factors and irresistible, if not entirely automated, results prompted by "the environment." It is also about the courage, convictions, and priorities of the person with the pen in his hand. No one should ever lose sight of that. So, the President says, he "asked" his "team" to "look more systematically at how clemency could be used to address particularly unjust sentences in individual cases." Again, the word "individual" is somewhat obnoxious. The President (we guess) is overly-defensive about the call for amnesty for the many thousands he has left behind in our federal prisons. [The pardon power] is also about the courage, convictions, and priorities of the person with the pen in his hand. No one should ever lose sight of that. Obama claims "an unprecedented effort to identify the types of inmates who deserve particular consideration for clemency" followed. 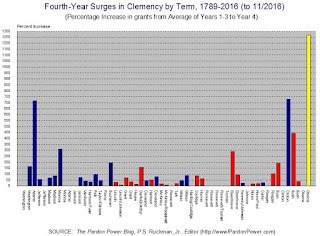 Interestingly, he does not emphasize much that this "effort" took place outside of DOJ - where clemency applications have traditionally gone to die. That should, in and of itself, say something, actually a great deal, about the need for reform in DOJ, or, even better, moving the clemency process outside of DOJ altogether. It has not always been there. Then, the piece gets all ugly. The President repeats his now tiresome jingle that he has commuted "more than the previous eleven Presidents combined." 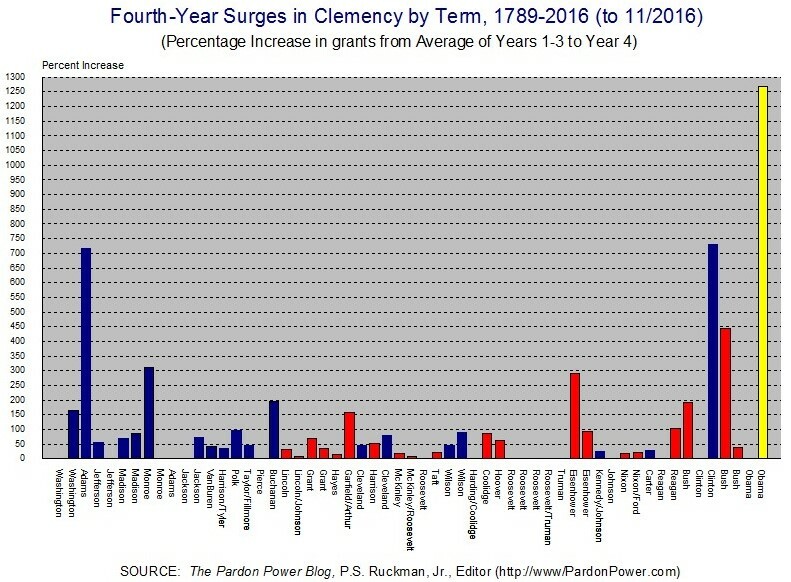 He says nothing of the fact that he has probably received more commutation petitions than the previous eleven presidents combined and that his grant rate is not exactly record-setting. Nor does he say that he has set records for applications that are denied or closed without presidential action. That's just the kind of "data analysis" this world does not need. The obfuscating rhetorical devices of campaigns should be left ... in campaigns. Finally .... yes, that's it (! ), this all eight entire years of introspection on this topic have produced (!) ... the President says that his effort, or the effort of his "team" has "touched" him "personally" because he "could have been caught up in the system" himself had he not "gotten some breaks as a kid." He then tells the "stories" of two clemency recipients. By shifting the narrative to the way clemency can be used to correct injustices in the system — and reminding people of the value of second chances — I worked to reinvigorate the clemency power and to set a precedent that will make it easier for future Presidents, governors, and other public officials to use it for good. You would never know that President Obama waited longer than any other president in history (save George W. Bush) to grant the first pardon of his administration. You would never guess that his first term was the least merciful since the first term of George Washington. You would never guess that, until just a few days ago, he had granted fewer pardons than any president since John Adams. You would never guess that the author of this piece is currently engaged in the greatest last-minute clemency surge in American history - after six long years of neglect. 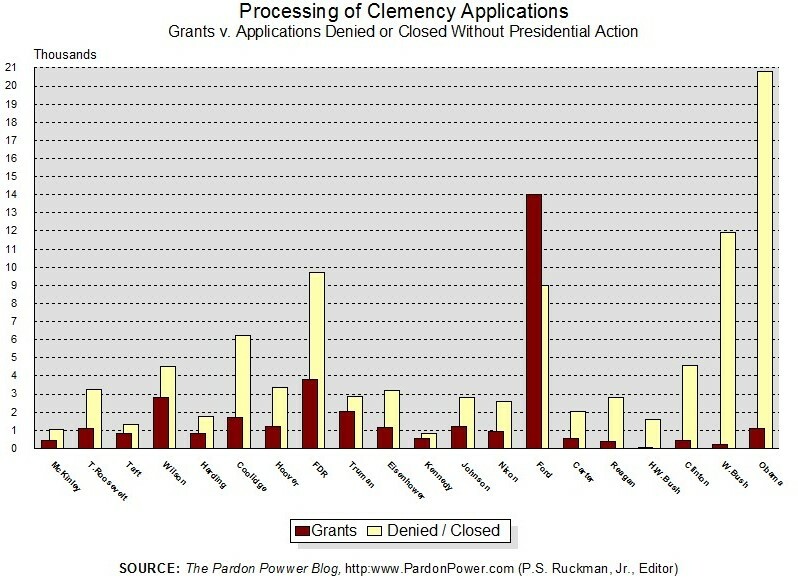 And, to boot, the clemency process is less transparent than ever. 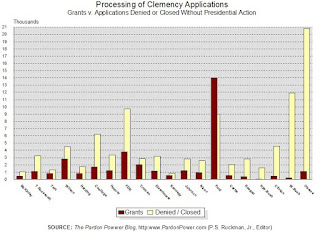 Has Obama really made it "easier" for anyone to grant clemency? Hardly. Has he set a precedent? Oh Heavens! We certainly hope not!!! See Obama's full article here. 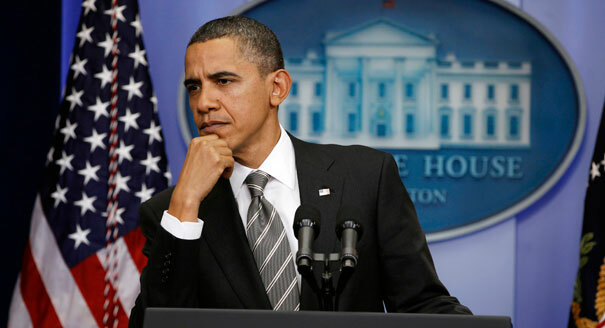 Would you rather Obama let the 1,176 people rot in prison rather than free them? None of them seem to be complaining about their commuted sentences. I recommend you don't look a gift horse in the mouth. After all, you won't be seeing many pardons or commutations for the next four years. I recommend you read up on the topic more seriously and craft your rhetorical questions more artfully.